The Mini Coach's Cart is the smaller 150-ball option to the full-sized Coach's Cart. The removable basket makes putting the cart in your car or pouring balls into a ball machine quick and easy. 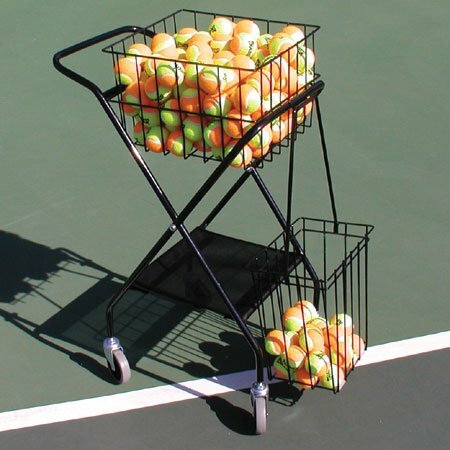 SMALLER OPTION: The Mini Coach's Cart Is the Smaller 150-Ball Option to The Full-Sized 250-Ball Coach's Cart. SIMPLE SETUP: It Sets Up Faster and Easier Than Any Other Travel Cart in The World and Works for A Number of Sports ... Tennis, Baseball, Softball, Pickleball, Etc. DURABLE: Quality Mesh Bottom Tray. Same Rugged and Smooth-Rolling 4-Inch Wheels as Our Other Carts. Indoor and Outdoor Use. PORTABLE: The Mini Coach's Cart Will Easily Fold Down and Fit into Cars. Folded Length: Only 43 Inches. REMOVABLE DIVIDER: Removable Mesh Divider Helps Separate Transition Balls for Quickstart Tennis. Front Ball Basket Not Included.